Curly noodles tossed with marinara and alfredo sauce. 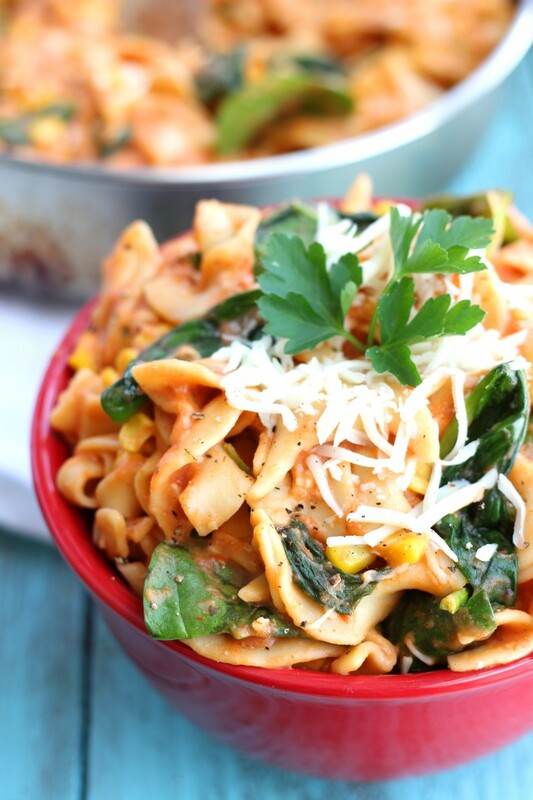 Mozzarella cheese, Parmesan cheese, corn, and spinach are added to this one-skillet meal. Ready in under 30 minutes and a crowd-pleasing, family-friendly meal. So earlier this week, I was baking away in my kitchen. Recipe experimenting and as per usual, making plenty of dirty dishes. In fact, making dishes dirty tends to be one of my better talents. I can dirty every measuring cup, spatula, mixing bowl, and spoon within about 10 minutes of baking. I so wish I were joking. Okay so here I was in the kitchen making dishes dirty while singing the wrong words to some silly song my baby was playing over and oven again while sitting in his highchair right by me. I never seem to get the words right, but it doesn’t seem to bother him much and that’s not really where this story was going anyways. All of the sudden in the middle of my incorrect words to this song, water touched my feet. I was standing in a puddle, in my kitchen. Turns out the kitchen sink had a faulty part and leaked all over the kitchen. So, I quickly called a plumber, turned off the water, grabbed every towel in the house and dried it all up. Okay, so a bit of a mess, but not a huuuuge problem. Until the plumber came. And didn’t have the right part. And wouldn’t have it for 3-4 more days. And now we have the part, but no plumber. Because the plumber was supposed to come yesterday and then something came up and now he is coming Monday. So in the meantime, the water in the kitchen is turned off. Which proves tricky when there are lots of dirty dishes. Remember how I was telling you of the stockpile of dirty dishes I had created? And I can’t just leave all the dishes sitting in the sink… Soooo I had the brilliant idea (okay, I can’t take credit, it was my husband’s idea) to take dishes upstairs to the bathroom to wash them. And so that was a very fun adventure. But basically, the moral of this story and the fact that I haven’t talked about this meal yet? It’s to tell you three life lessons: 1.) 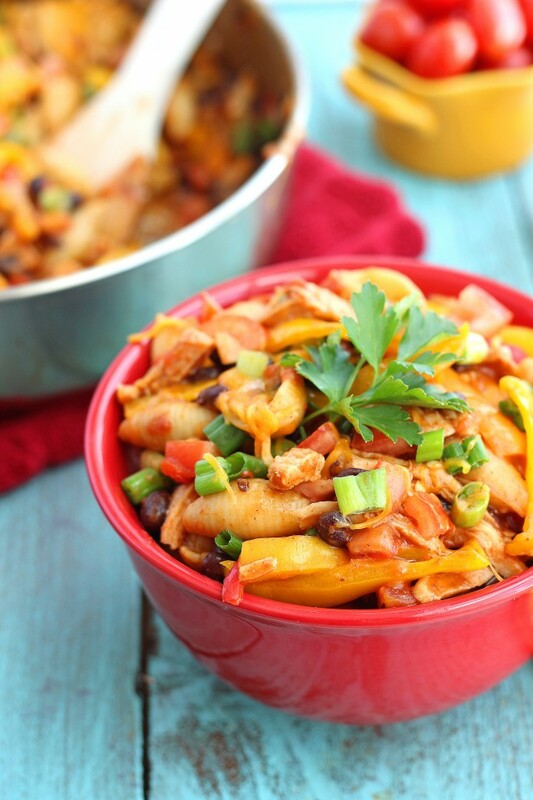 Sometimes one skillet and little mess dinners are a MUST and a great thing in life 2.) If you are bored of cleaning dishes in your sink or using your dishwasher, hauling dishes upstairs to a bathroom is a must-try thrill. 3.) When life gives you lemons, try to make as little dirty dishes as possible because #2 turns out to be not as exciting as I led you on to believe. In a large pot, bring salted water to boil and cook the noodles. 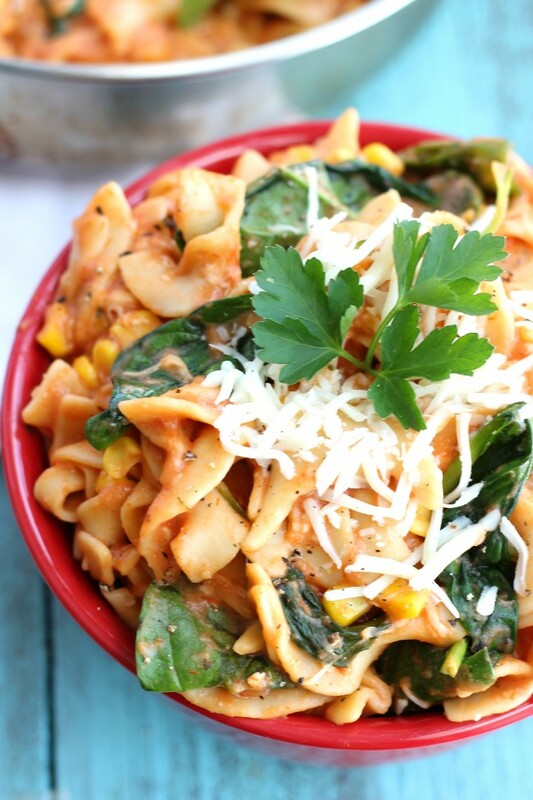 While the noodles are cooking, wash and dry the spinach and shred the cheese. When there is about 2 minutes left until the noodles are done, add the frozen corn to the pot. Drain the noodles and corn. Return the pot to the stove and turn the temperature down to low heat. 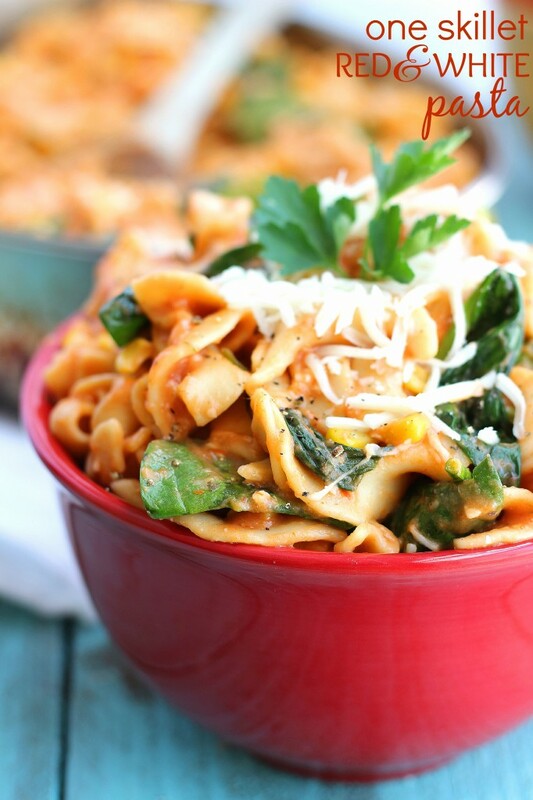 Immediately stir in the alfredo sauce, marinara sauce, and spinach. When everything is mixed together, stir in the cheese to taste preference and serve immediately. Optionally garnish with additional Parmesan cheese. *If you don't like cooked spinach, you can omit the spinach and it won't affect the meal. I've made it without spinach and it tastes great! I am the worst at dirtying up a kitchen. & to then have the sink start leaking? – I’d be a mess! This would be a great dinner to calm me down though 🙂 Thanks for sharing! Oh man!! That IS an epic adventure. I wish I could say I’ve never been there but…. Hopefully it will all be sorted out on Monday! And in the meantime, I shall be vaguely obsessed with this pasta. One-dish skillets don’t happen often enough around here! Oh man, I would hate to have to haul dishes upstairs to clean! Although I also can’t stand dirty dishes in the sink for too long so I probably would have resorted to that as well : ) And no water in the kitchen – I can’t imagine! We’ve been having some problems with our hot water heater lately but at least I do have water (albeit freezing!) haha And this meal sounds delicious by the way! I am the same way – dirty dishes get to me way quick haha! Oh man freezing water when it’s freezing outside (heck, even when its warm outside) is the worst! Hope it gets fixed for you Ashley! Thanks so much, hope you’ve had a great weekend lady! Oh what an unfortunate thing! This pasta sounds and looks wonderful. 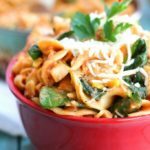 I love adding greens to my pasta –makes me feel like it is a bit healthier 😉 Rainbow swiss chard is a current favorite and I am certain it would work swimmingly with the alfredo/marinara sauce. Yum! 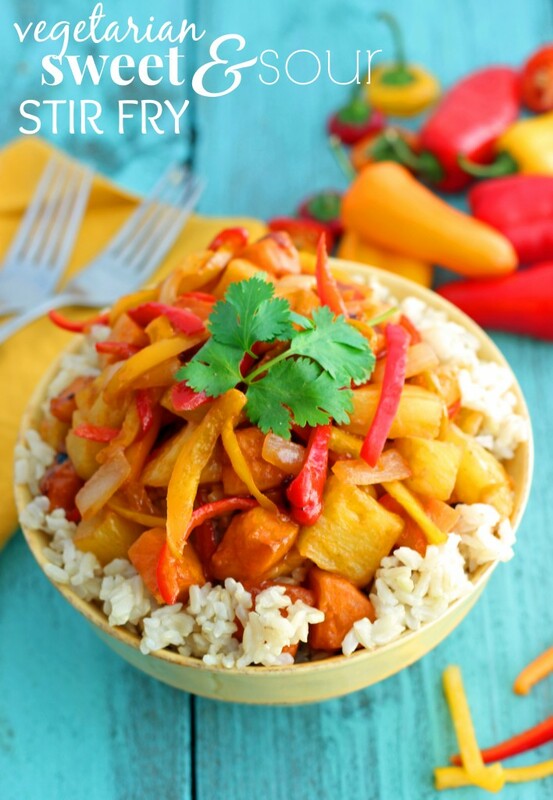 Even when the water is running, one pot meals are a gift on busy weekday nights! This pasta looks warm, flavorful, and satisfying for a cold winter night (and we have been having plenty of those!). To be honest, if we had no water in the kitchen, I would call pizza delivery and pull out the paper plates! I hope your plumber gets everything back in working order asap! Okay, seriously, the pizza idea – why didn’t I think about that?! Pizza on Monday if it isn’t fixed by then haha! Hope it’s all fixed now! Ah – cheese and pasta! Perfect comfort food! I always make a huge mess in the kitchen, but have never had the thrill of having to wash dishes in the bathroom….yet! I’m sure it must have been a real pain…….BUT your dinner looks delicious! 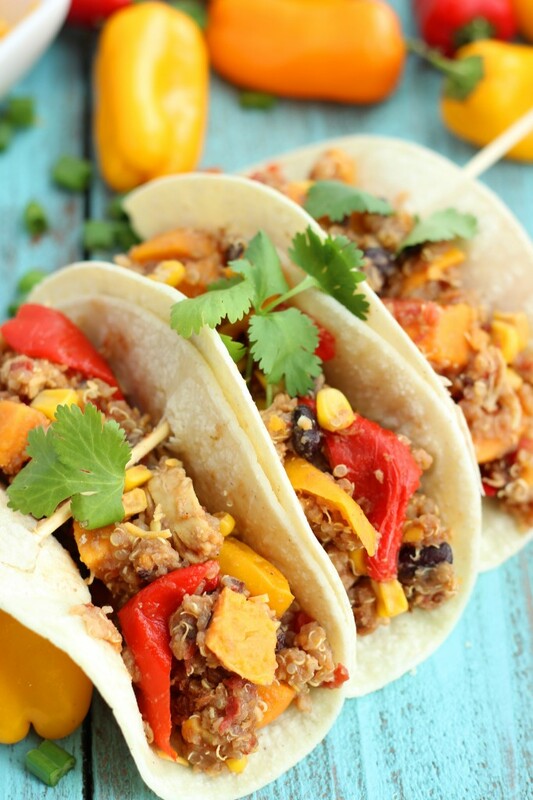 So does your sweet potato fajitas, I will have to try that one! Yikes, sorry to hear about the faulty sink – that’s horrible to happen especially when you have a little one to take care of too 🙁 Hope it gets resolved on Monday. Thanks Kelly, you are so sweet! I’m hoping so too 🙂 I hope you’ve had a wonderful weekend! I hate having plumbing issues! Ugh. This past dish looks so delicious. 🙂 And I’m totally digging that’s a 1 skillet wonder! This pasta looks so amazing and so simple! Definitely pinning this. Thanks so much Karen! And thanks for the invite, I’ll be sure to head on over! It’s a super-wonderful looking pasta! This looks SO good! I pinned it and am now following you on Bloglovin’! I’m glad that I found your blog on the Show Stopper Saturday Link Party!